A sign has been posted at the old L’Enfant Plaza Enterprise car rental location on D Street stating that they will be moving to their new Waterfront Station storefront on or near December 7. A peek inside the new storefront shows that the Enterprise sign is ready to go up on the exterior of 1100 4th Street. Has anyone seen whether Enterprise opened today? With the imminent opening of Enterprise, there remains one vacant retail space at Waterfront Station along 4th Street – a storefront located adjacent to Station 4. The 24th annual Parade of Lighted Boats will take place on Saturday evening from 6-8 pm at Gangplank Marina Park located at 600 Water Street. As in previous years, festivities include photos with Santa Claus, the lighting of the Gangplank Marina Christmas tree, a firepit with s'mores, live holiday music, gingerbread cookie decorating, the first "snowfall" of the season, and of course, the boat parade, where boaters decorate their vessels and compete for prizes. "1000 Maine offers both extraordinary creative office space and the opportunity for classic customized space within a top-tier trophy building with dramatic floor plates," said Amer Hammour, chairman of Madison Marquette. "1000 Maine's setting overlooking the Potomac River - in the heart of the nation's Capital - and with a full complement of outstanding amenities, creates a new benchmark in excellence for office design created to appeal to the most discerning national and global office tenants." 1000 Maine will be a 250,000 SF trophy office building, designed by Kohn Pederson Fox and Fox Architects for LEED-Gold certification, with ground floor retail, a multi-story atrium, and panoramic views of the Washington Channel and monumental Washington. The office building is scheduled to deliver in 2017. Below is a promotional video from the building’s website. 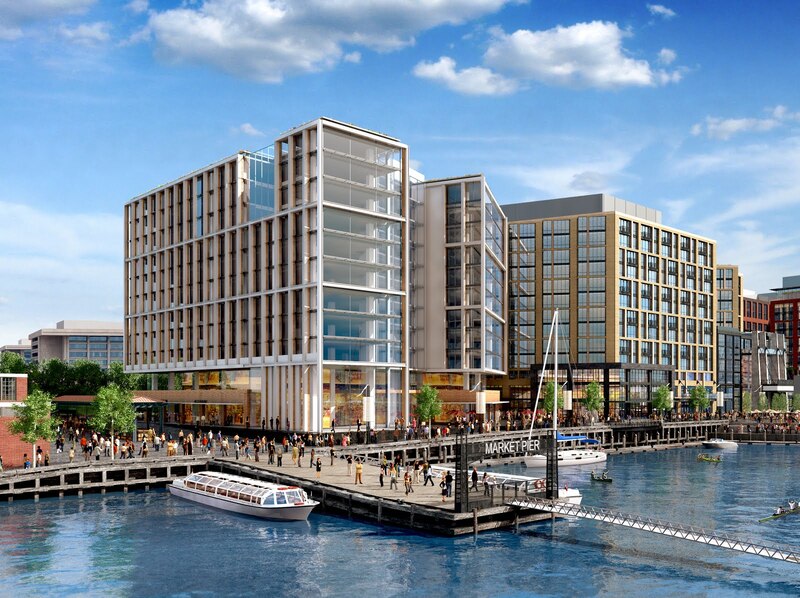 In other Wharf news, according to the Washington Business Journal, building permits have been obtained for components of Phase I in recent weeks, including Parcel 2 and Parcel 3a. 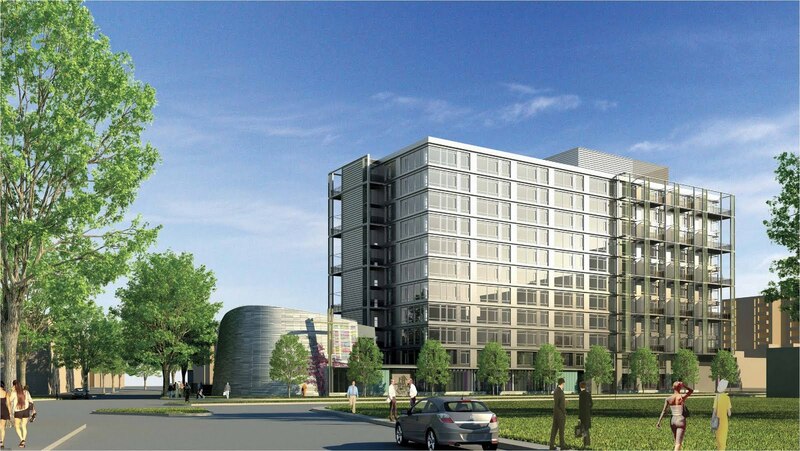 Parcel 2 will contain Wharf Hall and two apartment buildings, as well as a co-generation plant. 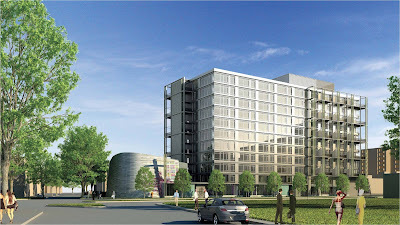 Parcel 3a is 800 Maine Avenue, an office building that will be the future home of the American Psychiatric Association. Meanwhile, construction is underway at Waterfront Park, located behind 525 Water Street condos and the new St. Augustine’s Church, which should deliver in 2016. Will St. Matthew’s Lot Finally Turn Dirt? St. Matthew’s Evangelical Lutheran Church will be holding another Christmas tree giveaway later this month on their vacant lot, located at 222 M Street. At last year’s giveaway, the development team said construction on a new sanctuary and 221 apartments would begin in April 2015, but financial complications due to the property’s location in a flood zone delayed the start of construction. This problem seems to be resolved, since the 17th Street NW levee project on the National Mall has since been completed, which moves the St. Matthew’s lot outside of the 100-year flood zone. According to Pastor Phillip Huber of St. Matthew’s, the latest estimate for starting construction is mid-January, with completion by the end of 2017, or sooner. The development team includes Trammell Crow Company and CSG Urban Partners. The Christmas tree giveaway will be on Saturday, December 12, starting at 10am. In order to receive one of the 130 free trees, a reservation is required – either email stmatthewsdc@hughes.net or call 202-484-3189, first come, first serve. Day-of reservations will be accepted on site, starting at 10am to pick up a tree after 12pm, if any remain. Free food and beverages will be provided during the giveaway. 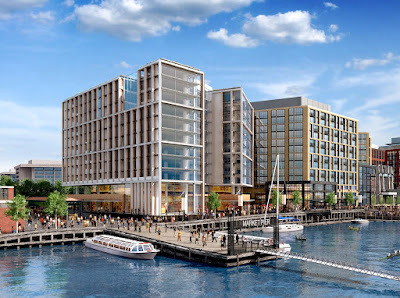 Hoffman-Madison Waterfront has submitted an application for Stage II PUD approval of 7th Street Recreational Pier, which was originally proposed to be built in Phase III of The Wharf, but may now be developed during the initial phase, in concert with construction of 7th Street Park. The pier will be located at the terminus of 7th Street, adjacent to the planned 7th Street Park and is one of the four public piers planned for The Wharf. 7th Street Recreational Pier has been designed by Michael Vergason Landscape Architects and Moffatt & Nichol, according to the Zoning Commission application as “a narrow quay for enjoying views of the water and the monuments, and will have a lower floating pier that can accommodate various rental activities and other water-based recreational program.” On the upper portion of the pier, wooden benches, oversized swings, lighting, and a “fire feature” are planned. As designed, the pier will gradually descend towards the water’s surface before rising to its terminus, 432 feet into the Washington Channel. A series of floating wetlands will be located to the east of the pier, providing visual interest and environmental benefits. A large shade structure is planned for the area where the pier, wharf promenade and 7th Street Park meet, which will include a gathering area and retail kiosk. In order to build the pier during Phase I of construction, a revised transition plan needed to be developed, specifically for the live-aboards at Gangplank Marina. The revised plan moves access to Gangplank Marina away from the construction zone of the pier and moves the live-aboards to a centralized location. ANC 6D will need to give its support before the pier design is taken up by the Zoning Commission. The U.S. Commission of Fine Arts approved the concept design back in July.